Welcome to ‘Why You Should: Play’, a monthly video series where we explore games from the past and why they’re still worth playing if you haven’t yet. This column has a sister series called ‘Why You Should: Watch,’ which can be found on and is exclusive to the same YouTube channel, as well as Ryatta Reviews. This accompanying article will be exclusive to iMG so you there’s always a good reason to check the videos out here, but if you’re interested in the ‘WYS’ show then I suggest you subscribe to the YouTube channel where you’ll get episodes more frequently. The Legacy of Kain series may possibly fall on deaf ears for those of you who’ve only come into gaming within the last decade. The Legacy of Kain franchise contained five vastly different games. It consisted of two main characters and a whole TV series’ worth of supporting characters across different ages in the fictional realm of Nosgoth. The plot of Soul Reaver takes place a few millennia after the original game of the series, entitled Blood Omen: Legacy of Kain. The eponymous Kain has become the leader of all vampires, with his children serving as his vampiric lieutenants. Raziel, his second in command enters a stage of evolution before Kain does–he grows a pair of wings, which Kain does not approve of. Kain destroys Raziel’s wings and tosses him off of a cliff to his doom. After a long time of suffering, Raziel is revived by a mysterious voice known only as the Watcher, who guides souls of the dead along their correct path. The Watcher reveals that Kain has corrupted his ability to do this and tasks Raziel with the job of saving the world by destroying Kain and his own brothers, who have grown further corrupted. In doing this, Raziel would also avenge himself. For the most part, each game in the Legacy of Kain series has a widely different style of gameplay. One exception to this is Soul Reaver 2, which retained many of the key elements of the first Soul Reaver sans the open world elements, forcing it to be more linear. 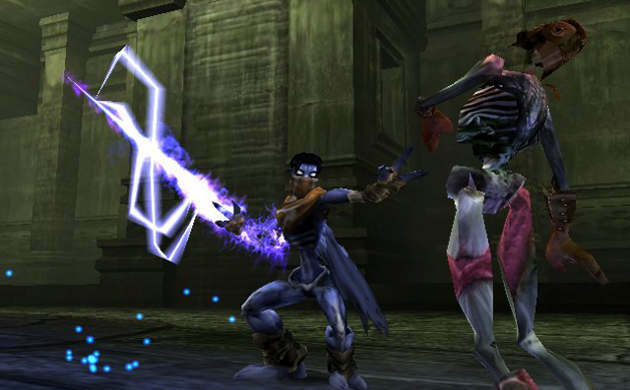 Soul Reaver’s gameplay could almost be compared to that of 3D Legend of Zelda titles; it has a similar combat system to the famous Z-Targeting, as well as open world exploration elements. While I like to remain positive about every game I cover there are a few negatives to Soul Reaver. For one, it hasn’t aged well. The sound effects and in-game cutscene animations look and sound quite bad. Despite this, the voice acting will be forever be remembered as some of the best from any video game series—a trait that continued throughout the Legacy of Kain series. The game was also unfinished when it debuted, which meant a number of things were removed from the game. For example, one of the brothers was never included in the game and was left out completely (though thankfully this was dealt with in future re-releases). Perhaps the biggest example of this is the ending. Soul Reaver just ends with a rather quick and boring boss fight. It’s a major shame, especially when compared to the rest of the main game. The sequel picks right up from there, but at the time that was another console generation away. A lot of the open world elements are sometimes unclear, and many extras you find along the way feel like they should have had more explanation of gameplay use. 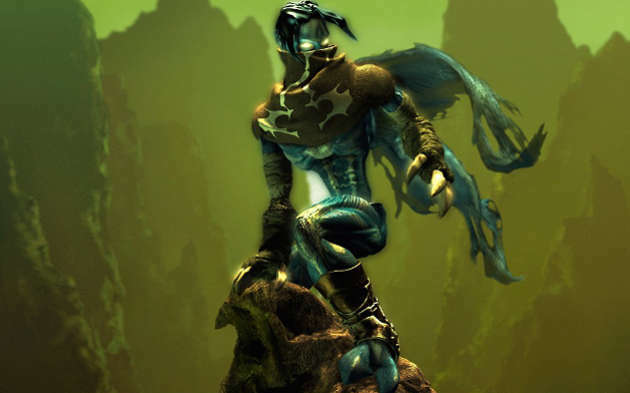 Cheat codes also reveal variations of the Soul Reaver that can’t be found in the main game, as well as a bigger use of your other spirit guide, Ariel, who you meet through the game. The story is a big theme of the series as a whole, and in the efforts to make a good game a lot of narrative sometimes takes a backseat so the gameplay can shine. The balance of the two would become better in future games of the Legacy of Kain series, but it leaves Soul Reaver with a skeleton of a main story and it writes Kain in as a full villain. In all other games, conversely, he’s more of an antihero and/or outright protagonist. However, this fits newcomers to the Legacy of Kain series well as they’ll identify with Raziel more while players of the original game will be interested in Kain’s fall from grace as the Scion of Balance and saviour. With its preconceived story over and complete, the Legacy of Kain series is a collection of games that are unlikely to get a sequel; and since the possibility of an HD update seems unlikely at this time, it’s worth getting the games as they are to try. The Soul Reaver games play out more like standard action/adventure games while the Blood Omen games are more experimental in gameplay; the final game in that miniseries plays out more like Devil May Cry. You might want to stick to Raziel’s story and just play his games to get the gist of Legacy of Kain’s central narrative. Regardless, it’s a series that shouldn’t be missed and I hope you feel a need to give it a try. You can pick them up very cheaply these days. That’s ‘Why You Should Play’ Legacy of Kain: Soul Reaver! « Dude, Where’s My Sequel?